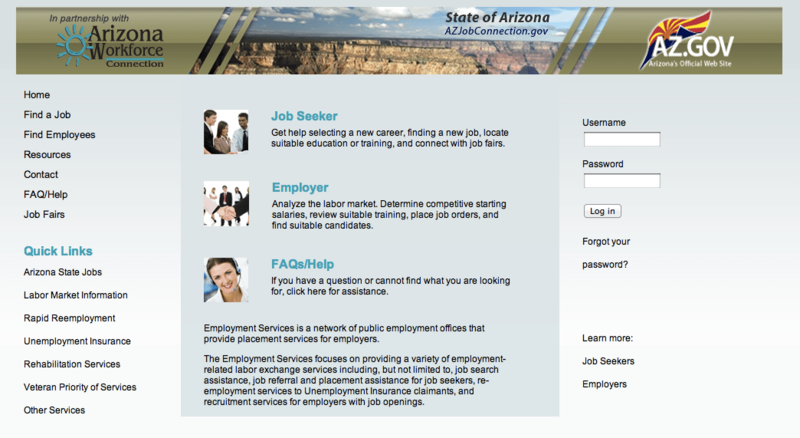 Arizonavirtualonestop.com has job related information for seekers and employers in the state of Arizona. The advantage of such a website in the face of others that cover all the country lies in the fact it is a locally-aimed service, and can give you 100% accurate results faster. Besides, it has a simple design that makes really easy browsing through it. You won’t find specially attractive or colorful visual effects, but on the other hand nothing is missing to find the information you may need. To use ArizonaVirtualOneStop’s services you must create a username and password like in so many other online pages. The good thing about this place is that its uses go further beyond than only looking for a job or finding employees. The amount of services related to working is surprising. In case you are an individual, the “Job Seekers” section includes many other sub sections that will get your attention. The Career Services link, for example, gives visitors a list of tools to guide them according to their personal employment or unemployment situation. These include finding out what kind of job you might enjoy best according to your skills and education. If you want to change career although you are already working, a list of tips on how to achieve it is provided. How to follow the right steps for obtaining a job in the area you whish to work in, is another Arizonavirtualonestop.com functionality. You can also find tools to handle your everyday budget under different situations, or check if you can afford some training according to what you earn or some savings you might have. It is also possible to find out if you are eligible for some benefit program that can help you through an unemployment period. A program for matching displaced employees with hiring employers is included in the “Rapid Reemployment Initiative”, put up together thanks to the collaboration of various institutions. Apart from posting job openings, the tools for employers looking to find quality workforce are as complete and as diverse as the ones already mentioned, like information on legal issues, tips for reducing workplace injuries, human resources articles, and so on. A powerful online job seeker/workforce services system. Arizonavirtualonestop.com brings together information for Arizona-based job-seekers, and it creates an environment where they can make better career choices. Could we know the percentage of employers and job seekers who have successfully used the service?